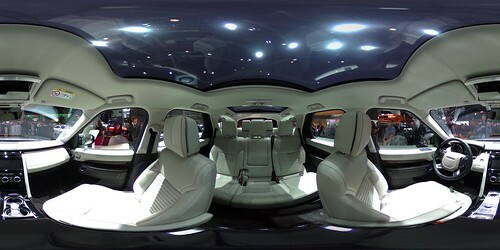 Land Rover has unveiled its new Discovery at the Paris Motor Show. 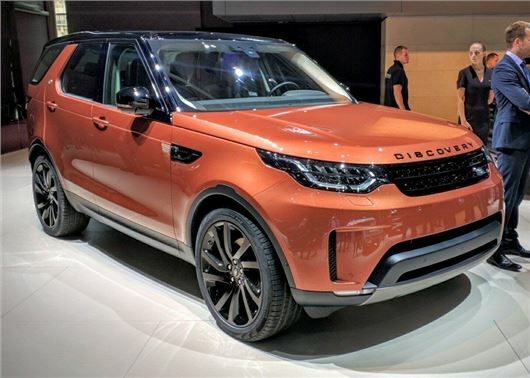 Although it may look similar to the outgoing model, the new Discovery is bigger and more efficient. It goes on sale in the UK in spring. Prices start at £43,495. The familiar-looking seven-seater SUV boasts something called 'remote seat folding technology', which means the interior can be configured via your smartphone. No, we don't know why, either. At least the new model will be better on fuel economy and emissions. Lightweight aluminium construction means it's 480kg lighter than the outgoing model with CO2 emissions starting at 171g/km. As well as the existing 3.0-litre V6, power will come from a 240PS version of the 2.0-litre Ingenium four-cylinder diesel. New Discovery also boasts an improved towing capacity of 3500kg, as well as a semi-autonomous advanced tow assist system to take the stress out of reversing with a trailer. Inside, up to 2406 litres of luggage space will be available and the SUV will be equipped with nine USB ports, four 12-volt charging stations and an in-car 3G wi-fi hotspot. Oh dear, another step back for Land Rover. This looks like a cross between an Evoque and a Disco Sport. Ugly doesn't even cover it. But with 9 USB ports and 3g WiFi it will appeal to the farmer and any one else needing a good sturdy 4x4 for earn its keep, whoops sorry I was thinking of a Td5 or even a Defender. This latest thing it what gives 4x4's a bad name like Chelsea tractor and I can see most Cheshire wives liking it. Any one want a workhorse, an offer road car and want value for money it looking at the Japanese or even Chinese market, and that's a shame. Land Rover was always known as a tough no nonsense working vehicle, the Range Rover was the luxury car. If there is a wealthy farmer with too much money, who needs all the gadgets to pull his 3500kg trailer would he buy it, I think not. As for the average person wanting a 4x4 to tow their caravan I can think of much better and more reliable 4x4's for the job. Oh dear right, looks like a large Freelander, stick with the MK3/4 model thank you. Oh Dear, more expensive, more de-luxe, less off-road and towing ability. The original Discovery was just a slightly more comfortable Defender, but had the same ability and the same practicality. Now we have no Defender and a Discovery that seems ideally suited to taking your children to public school but not much else. Where is the practical Land Rover that can tow a horsebox, take a bale of hay and a load of muddy riders, or drive you to the pub in comfort to recover? Farming contributes 0.7% to UK GDP. In other words, it is actually just a hobby - mostly for rich folk anyway, and they will love this. Chuck in the footballer's wives and the school run mums and another winner for JLR. We could only hope it is a tad more reliable.